Both the Diva Weekly Challenge #280 and It's a String Thing Adventure #158 focus on the 2016 Olympics in Rio for their themes this week. "Go for the Gold" is a phrase I grew up hearing, an idea that encourages us to dream big and work hard toward those dreams, to give your best, like the Olympic Athletes who strive to land the most difficult vaults, set new world records, be the first person to breakdown an old barrier. 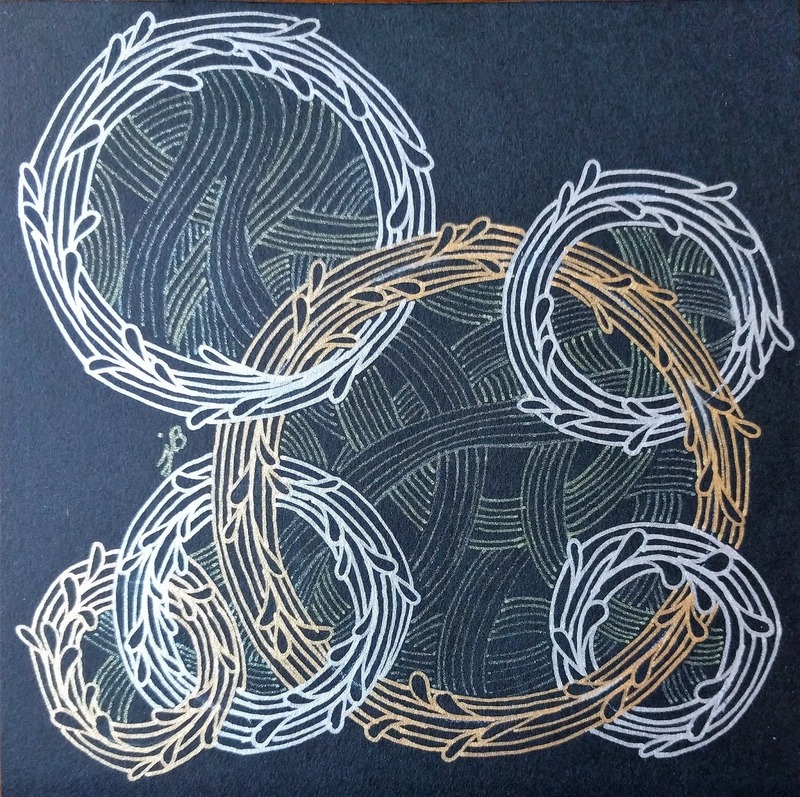 I was inspired by this idea and by Olympic rings with the crown of Flux on the Diva's own challenge tile this week. 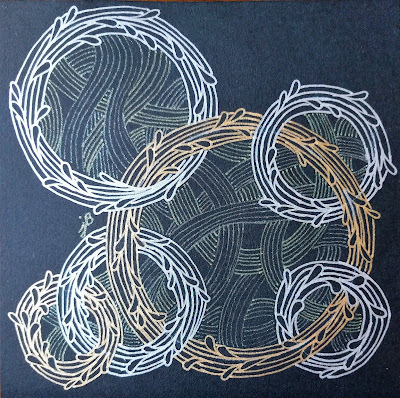 I chose interlocking rings as my string and the tangle Fleavy by Linda Farmer, CZT in gold and silver metallic gel pen on black paper. 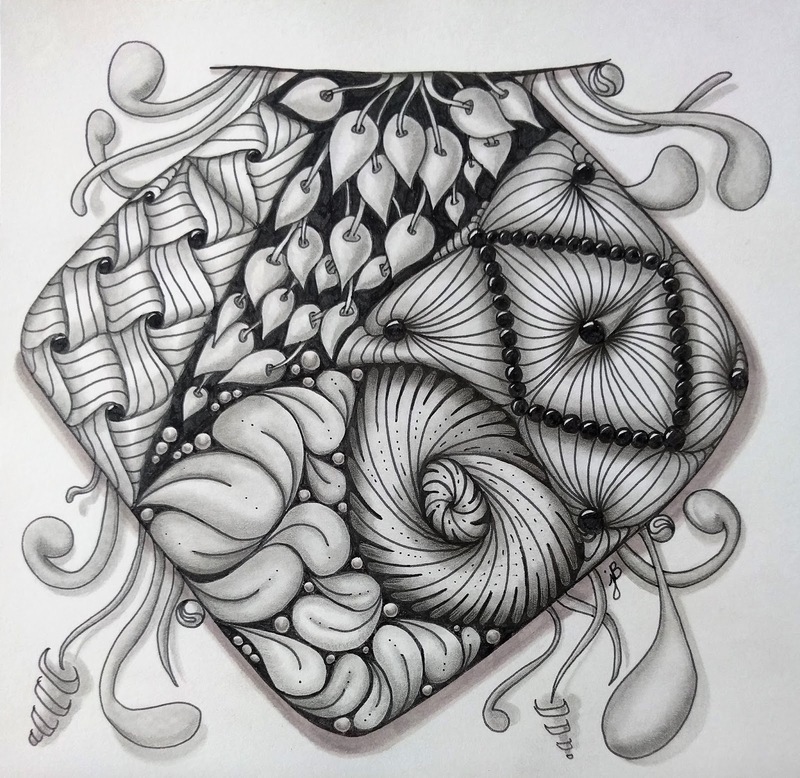 I've been seeing some lovely tiles using this tangle and it was one I wanted to add to my toolbox of go-to patterns. Inside the rings I continued with a pattern that is essentially a collection of curvy auras, Fleavy without the leaves, using Hollibaugh's drawing-behind technique. I'm not sure if this pattern has it's own name or not. If you know of a name for it, please leave me a comment and let me know! 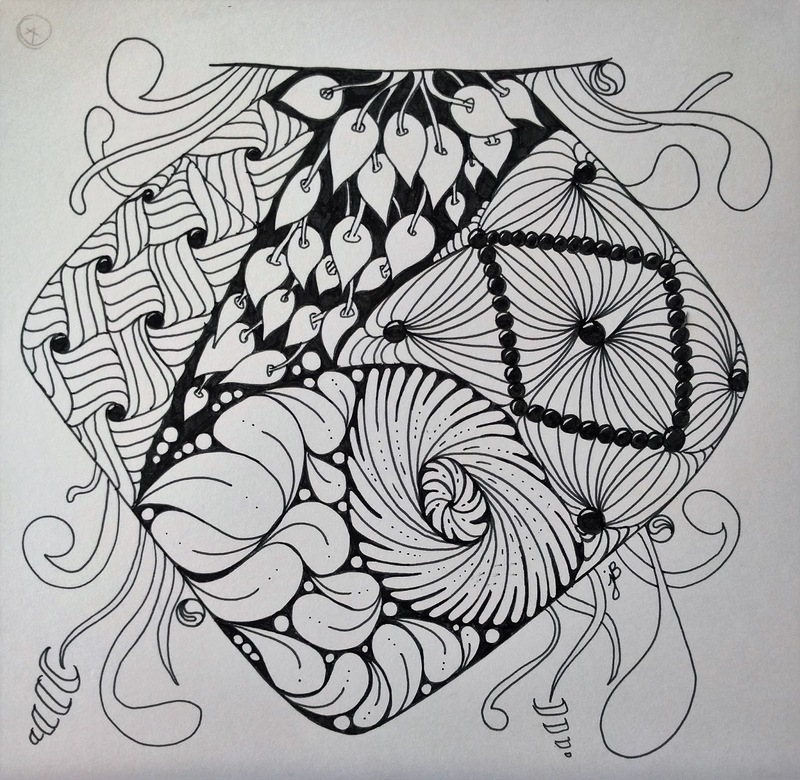 This pattern in the center was made with some of the Gelly Roll Moonlight Stardust pens. 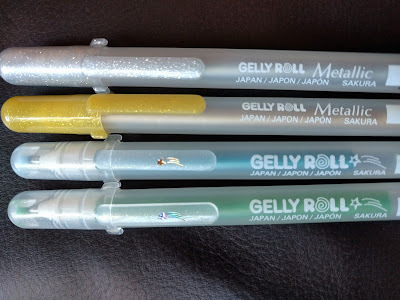 I noticed as I tested out my materials on a scrap, that the main color of the Moonlight pens (green and blue in this case) soaked into the black paper leaving only a thinner line of the silver and gold sparkle behind. It was an interesting way to be able to achieve different line weights and keep the center pattern from overwhelming the Fleavy rings. In this week's string adeventure, CZT Adele Bruno challenges us to use the new tangle Drogon by blogger and artist Lilly Moon and our own favorite or "Gold Medal" tangles. I've been using group challenges to push me out of my comfort zone for the last several months, learning new tangles every week. So I had to flip back through my sketchbooks and older tiles to recall my go-to patterns. 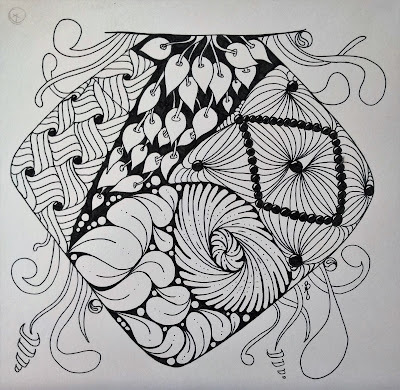 Classic Zentagle patterns Mooka, Poke Leaf, Flux, and Zinger were shoo-ins. 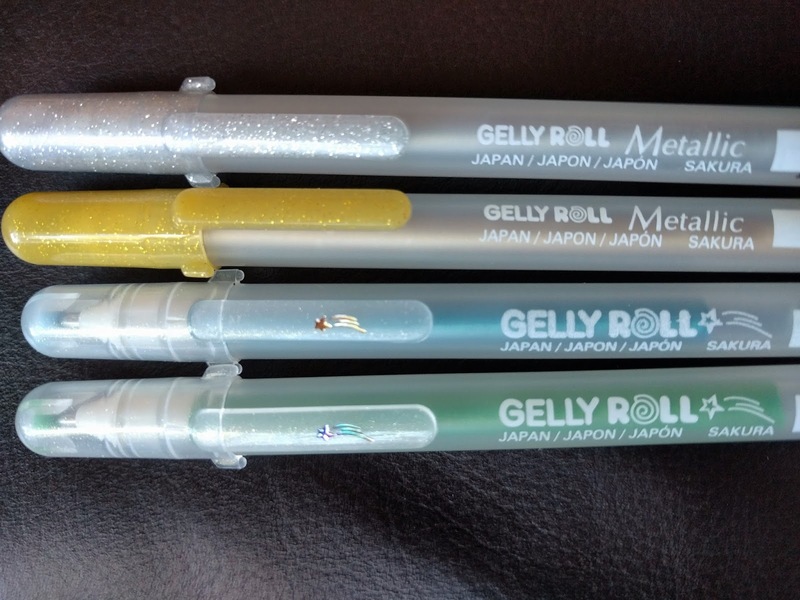 Nebel is a newer addition I've come to appreciate, and Niuroda is another new-to-me tangle I have been itching to try out. Oh, and I sprinkled a tiny bit of Cruffle in there as well. Focusing on these dedicated Olympic athletes and the Olympic Rings that symbolize their dreams and achievements reminds me of a visual representation of Ikigai, an idea about finding one's purpose. Ikigai, according to the article on Wikipedia, is "a Japanese concept meaning 'a reason for being'. Everyone, according to the Japanese, has an ikigai. Finding it requires a deep and often lengthy search of self." The flash fiction story of who I am, the sound-bite I put in my profile these days is: reader, writer, mother, dancer, dreamer, artist. My life has evolved from one focus to another, one 'reason for being' to another. As a homeschooling mama, in raising my kids and facilitating an education for them, I find myself in that intersecting space between passion and vocation. I hope to guide them to be compassionate people who do good in the world, so I think I see some mission in there as well. Right now I feel like I am in the passion stage as an artist. Art is what I love and learning new things is something I am pretty good at, so this journey where I am learning to make art that I love is a pretty fabulous place to be. Next though, next I want to enter the mission stage. Making art that the world needs? That sounds amazing. What about you? If you are reading this blog, have you found a place in your life where PASSION meets MISSION? A beautiful tile for the Diva, I really like the pattern Fleavy (I didn't knew it but now I do, thanks to you)and a very nice composition. Also, the "string thing tile" is wonderful. Very kind of you to show us the importance of shadowing. And about Ikigai, I understand what that means. People who have found this live satisfied,but onfortunately not everyone can find that... I was in the neighbourhood when I worked as a teacher and travelingguide, but also writing, drawing and giving workshops brings me a bit more to that target. People who find this live satisfied -- such true words! I am happy to have met you through art on this journey to finding our reason to be, Ria. Your Diva tile is gorgeous, I LOVE it. I never heard of Ikigai before, but love the concept. Now, at 68 years of age I think (hope) I finally found it. Thank you for your kind comments, Anne. Finding ikigai does seem like the kind of thing that takes a good part of one's lifetime to find! Both are beautiful! Interesting to read about the IKIGAI concept ... thanks for sharing! I'm glad you enjoyed this post, Annette. Thanks for visiting! I just had to stop by and let you know how wonderful your IAST tile is. I've enjoyed looking at it a couple of times already today. Thank you so much for your sweet encouragement, Karen! Thank you for visiting! What a fantastic post! I love your artwork and thank you so much for stopping by my blog and leaving your lovely comment. It led me here;-) I love the concept of Ikigai. I've never heard of it before and it makes so much sense. Thank you! Thank you for the kind words and for visiting, Michele!